Michigan law requires that all dogs four months of age or older be licensed. Dog licenses are available beginning December 1st of each year for the next year (example: dog licenses for the year 2012 went on sale December 1, 2011) and are available through March 1. Proof of sterilization must accompany vaccination slip from veterinarian to obtain license. You must present a valid certificate of rabies vaccination for your dog(s) in order to receive a license. Any person owning a dog that becomes 4 months of age at any time after the first day of March shall secure a license and pay the applicable fee as listed above. In person: At the St. Joseph County Animal Shelter or the St. Joseph Treasurer's Office any time of the year. City, village, or township offices in St. Joseph County also sell dog licenses from December 1 until March 1. Rabies certificates will be returned with the new license. Licensing your dog is an important way to show you care for your pet. Dogs which are licensed are guaranteed to be free of rabies. Additionally, your dog's license number allows you to be identified and notified if your dog should stray and be picked up by Animal Control Officers. 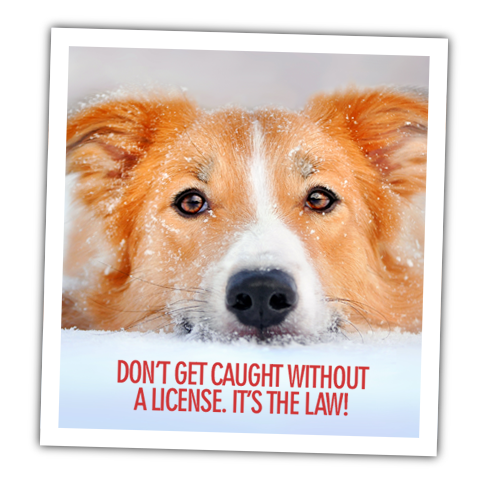 By licensing your dog on time, you pay the lowest possible licensing fees, and avoid potential fines for failing to license your dog. Finally, you should license your dog because it is the law.